Shelby’s Guide To…When Is The Best Time To Visit Disneyland? It’s Shelby’s Quick and Dirty Guide to When Is the Best Time to Visit Disneyland! How’s that for an atrocious sentence? Please don’t tell my esteemed writing colleagues. Anyway, so last night I got an email from a friend in the Midwest who is thinking about coming to our happy place and wanted to know when the best time was to come. I actually get this question a lot and have devised a quick and dirty way to answer it, so I thought I’d blog it. Also I’ve been gone for a while and I probably only have like 3 readers left. Hi Dad! Before I get to the answer I need to explain a little bit about annual passes. Disneyland offers 4 annual passes. The two cheapest are for Southern California residents only, and in exchange for being cheap, you get fewer amenities. The handy little chart on the website demonstrates using colored dots all the fun things you’re missing out on by being a cheapskate. Oh! A discount on guided tours! There are, of course, only two things that matter: the number at the bottom, which is the price, and the number at the top, which are the blockout days. Unless you really want that discount on guided tours. 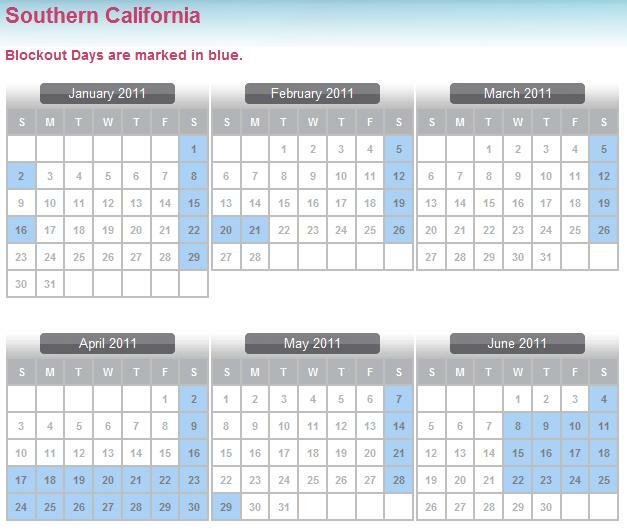 At any rate, the secret to determining the best time to visit Disneyland is the calendar under the “Southern California” pass (the purple one). 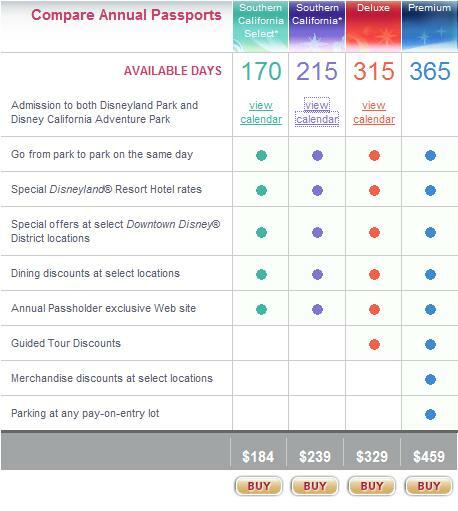 Disneyland has scientifically determined which days they anticipate being the most crowded through the coming year, and they’ve blocked out those days on the less expensive passes, particularly the locals. The Southern California Select pass doesn’t include any weekends so I think the only people who buy those are the unemployed and the elderly, but the Southern California pass, which is what I have, includes Sundays. Not Saturdays, since I think that’s a stick-it-to-you to try to get you to buy the most expensive pass, but it’s got a pretty good overview of when the park is likely to be more crowded. The calendar can be found here. This is just a screen shot. Don't break your eyes trying to read it. Those last two weeks in April are Spring Break. I know what you non-Californians are saying–“Spring Break happens much earlier!” Not in California. And since a huge number of Disneyland guests are Californians, that’s when we’re blocked out. Lucky for you out-of-towners with earlier Spring Breaks! Come on down! There are probably much better and more accurate ways to determine the best time to come to Disneyland, but if you’re looking for a quick and dirty guide, use the calendar. Happy travels, and remember–if you’re in town and want to be an honorary MYWTMouseketeer, shoot me an email and we’ll see if we can hook up! We just got our passes on Saturday. We did go with the So-Cal select pass, only because we figured we’d leave the park to those crazy out of towners. Plus being that we live right down the street, we can go just about any day during the week for a few hours (by then K (19mo.) is exhausted anyways! We just got our passes on Sunday too and ran into Stacy and family there outside of Dumbo (what are the odds of that?!). Here’s another tip: No matter what pass you buy your pass is always valid on the day you purchase it. So always buy the cheapest Southern California Pass on your first day with the pass (or your first up-grade day) and then on your second visit with your pass, if it is a black-out day you can upgrade then. And as far as crowds go – heck if I can figure it out! I’m beginning to believe there is no rhyme or reason to it at all. I think least crowded day I’ve been was on a Summer Saturday (July 6 to be exact) last year. I’ve heard Super Bowl Sunday is one of the least crowded as well as New Years Day. Side note: Some Disneyland firsts for us yesterday: The Disney Princess area and California Adventure’s World of Color. A++++ for both! I LOVE this blog. You are an absolute genius for starting it! As an aside, once upon a time I was chatting with the head of Disneyland Paris (ha! sounds so . . . so . . . so well-connected doesn’t it? Don’t be fooled!) and he told me the best day to go to Disneyland Paris is Tuesday. So, if you are thinking about expanding your blog to include the more exotic European version of Disneyland, Tuesday is your day. My friend went today (Tuesday) and said there were no crowds, no lines they walked right on everything! Shelby, you are hilarious! Some friends are mine are headed to Disney World though. I still want them to read your blog!